This is an easy recipe that doesn’t require a lot of complicated ingredients. And since this is my first time posting a recipe on my blog, for those of you who I am not connected with on Facebook and you don’t know this about me already, unless it’s a recipe that I’m actually following, I don’t do exact measurements. I’m one of those by sight and by taste cooks, so if I post a recipe that I create by sight and taste, expect me to be pretty vague when it comes to measurements. This particular recipe just so happens to be one of those with vague instructions. I apologize in advance for not being more exact for those who need it, but I just don’t have the time, nor the desire, to figure out exact measurements. 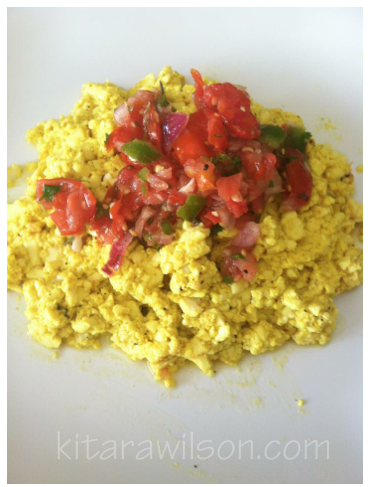 Besides, based on the hundreds of recipes I’ve read and tried, people tend to alter the original versions anyway, so in that same spirit, feel free to take what I have here and suit it to your liking, or, search out another tofu scramble recipe (that’s how I learned) with exact measurements listed. Either way, enjoy! *Black Salt can be found in local Indian markets and online. It has the smell and taste of eggs (hard boiled IMO) which really gives you a close-to-egg experience in terms of taste. The salt is a very light tannish color and the texture is powdery. It doesn’t resemble salt at all in sight, smell or texture, but it is a form of salt after all and even though it tastes like eggs, be careful because in your quest to make your tofu taste like your favorite Saturday morning eggs, you don’t want your scramble to become too salty. Lightly coat a non-stick skillet with cooking spray and heat. Open tofu and drain. Place entire block of tofu into heated skillet and begin to break it down with a spoon until it is in small crumbly pieces. Add about a teaspoon of ground turmeric and mix into the tofu. The turmeric serves to to turn your white tofu yellow. If after mixing in you don’t find your tofu yellow enough, add more turmeric. Once your tofu has reached the desired color, season with black salt and pepper. Place all ingredients into blender or food processor and blend/process. Take a spoonful and plop on top of your tofu scramble and enjoy!